Automobile GPS navigation systems provide drivers with dynamic street and highway maps, driving directions, and directories of restaurants, hospitals, car services, and other points of interest (POI). Voice prompts and alerts let the driver keep his attention on the road. The newest and best GPS systems have full-color 3-D street maps, traffic alerts and rerouting, integrated hands-free cell-phone use, and easy touch-screen controls. 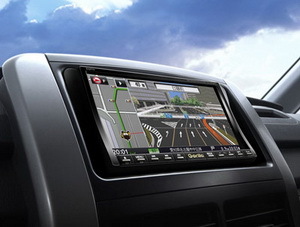 Some of the best GPS models, such as the Garmin Nuvi 1690 and 1490, have wide-screens, FM transmitters so that you can hear your voice prompts and alerts through your car stereo system, Bluetooth wireless connection to your cell phone, theft prevention features, long-life battery operation, and more. People who use such systems for the first time are usually amazed at the devices’ incredible accuracy and almost-magic capabilities. They often wonder why they didn’t get one sooner and how they could possibly do without one in the future. There are three ways to acquire a car GPS system. One is to buy a new vehicle with the navigation system already installed. The second method is to buy an aftermarket in-dash unit (e.g., Pioneer) that replaces your standard radio or stereo system. And the third method is to buy a separate portable unit, such as those by Garmin and TomTom, that can be easily mounted to your vehicle’s dash or windshield. There are advantages and disadvantages for each of these methods. New-car built-in GPS navigation systems offered as standard equipment or as options on new vehicles are more expensive than add-on units, often much more expensive. However, the LCD screens are usually larger, allowing for better visibility, especially while driving. The navigation system’s LCD display is usually shared with other systems in the car, such as radio, climate control, and hands-free cell phone. Also, with built-in units, the antenna and power attachment are already part of the vehicle. A disadvantage is that built-in sytems are usually a step behind in new features and map updates. Map updates are usually offered annually and must be purchased at a dealer. The updates cannot be downloaded by computer. Most new-car makers now offer built-in GPS navigation systems in at least some of their models. Add-on In-dash GPS navigation systems replace a vehicle’s normal radio or radio/CD player and typically include a large LCD display, navigation system, AM/FM stereo, and CD player. Some even include a DVD player to watch movies on the LCD screen (not while driving, of course). The LCD folds into the unit when not being used. This type of system is ideal for RVs. These systems are moderately expensive, should be installed by professionals, and usually require installation of an outside antenna. These are not good for leased vehicles since vehicle modifications are not allowed. These systems cost less than new-car built-in units but cost more than portable units (discussed delow). The Pioneer AVIC-U310BT is an example of an in-dash add-on GPS unit. 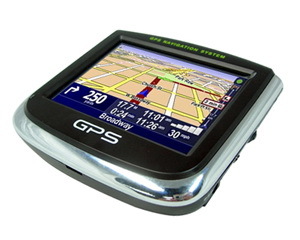 Portable GPS navigation systems , such as those from Garmin, Magellan, Navigon, and TomTom, have more flexibility in where and how you use it, the ability to swap the unit from one car to another, can have more features, and are less expensive than a factory-installed built-in or add-on units. If you frequently rent cars, drive business or leased vehicles, or trade cars often, a portable unit is a great solution. Portable GPS units come with a wide variety of features and screen sizes – and a broad price range, depending on your needs. Some are wide-screen, some standard screen. Many have features such as Bluetooth connection with your cell phone while driving. Others have music players and photo displays. A few offer real-time traffic display, usually for a monthly subscription fee. Most portable GPS systems easily mount to a vehicle’s dash or window, allowing quick removal when not being used. Most new devices have powerful satellite receivers and built-in GPS antennas, eliminating the need for an external antenna. Some work from batteries while others require the use of a power plug. It’s easy to update portable GPS devices with new maps and updated software by attaching it to your PC and downloading from the manufacturer’s web site. Another growing use for GPS systems is for tracking vehicles. Car tracking devices are often used by parents to track teenage drivers, by companies to track delivery vehicle routes, and by sales people to record vehicle use for tax purposes. These small unobtrusive devices use GPS to periodically record vehicle location, speed, stops, routes, and times. Depending on the system, the data can be viewed in real-time on a PC, or downloaded from the device later. 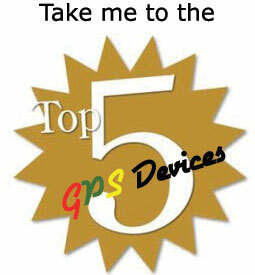 When buying a auto GPS navigation system, look for ease of use, voice directions, updatable maps, and a bright screen. A touch screen helps if you have to interact with the unit when driving. Some all-in-one (AIO) portable GPS units such as the Garmin Nuvi 765T, now offer travel-related features such as language translators, MP3 music players, audio book players, and more. If you don’t need all the extra features, buy a lower priced unit such as the Garmin 255. To mount your GPS in a vehicle, look for a unit that provides a mounting method that will work in your particular vehicle. @Gregg – smartphone based navigation apps have their advantages and disadvantages. We point many of the pros/cons of a smartphone navigation app vs. using a dedicated portable navigation device in the following article: PNDS Rule Over Smartphones With GPS Apps. Link to the article is below. Instead of a monthly update like the one you suggested, our list is only updated twice a year. Thanks for the link. Hi, checked out a top ten list at http://gpsbest.co.uk and was wondering if you had a top ten list similar to this on your site? Satellite navigation uses the Global Position System (GPS), a network of satellites which transmits signals to your sat nav device. At least 24 satellites are in operation around the world at any one time.GPS (Global Positioning System) car navigation systems can show and even tell you how to get to any destination. These products use the GPS, which relies on a host of satellites to determine where you are.Here in this post good steps are given to choose best in future. What about the Tom Tom app for the iPhone? It’s got a new lower price, too! Even the Magellan app for the iPhone is one of the most popular apps. Why use a separate device if you already have a GPS device (smartphone)? One thing worth mentioning is a car power adapter is definitely required. My iphone is drained after an hour when gps function is on. Phone GPS is nice when it works. I have a Blackberry with the mapping and GPS, but it drops out when you lose data connectivity. Sometimes when I travel for work, I find myself completely lost because I forget about this one big rub. Not all of the small towns I travel to have G3 connectivity. What I think would just be perfect would be a marriage of the traditional sized GPS with the connectivity and automatically upgradeable features of Google/Android. And as was pointed out to me elsewhere, Google/Android suffers when connectivity is not available. So downloadable maps for when you’re offline (out of range of a cell tower) would also be very beneficial. 1) FREE. If you already have the phone, it costs you nothing extra. 2) CONTINUAL MAP UPDATES. As Google Maps is updated, so is your GPS. There is no need to go out of your way (to a dealer or even to a nearby computer) to get an updated set of maps. They are constantly being updated at Google and since your cell phone is “live” connected to Google, your cell phone is constantly being updated as well. 3) NEW FEATURES. Google’s GPS software is relatively new and yet it has already been updated several times with new features. Life traffic updates. Satellite view (in motion, while you’re driving!). A street level view of your destination. Contour maps. And so much more. 4) Just the mere fact that you always have it with you… unlike a built-in GPS which stays with the car, if you switch cars, your phone likely goes with you. If you drive a friend’s car, your phone goes with you. And did I say it was free? These other GPS devices can only dream of constant live updates (and for that they would probably charge you a high annual $$fee$$). Google’s entry has a small form factor and is missing some of the niceties that a larger screen can afford. But wow, what an entrance!